Why do songwriters need to know about metadata? Isn’t that just for the business-side of the industry? Metadata is becoming a common word these days. It was the hot topic at South by Southwest 2016 and has made its way around the blogosphere in recent months. But what does it mean, and why should songwriters care? Metadata is a collection of information surrounding your music. There are a lot of great articles on music metadata, such as Hypebot’s review. There is no need to reinvent the wheel with this blog post, so we suggest you check out their post. A brief summary is that metadata contains all significant information about your song. This includes names of songwriters, composers, publishers, performing rights organizations (“PROs”) and more. The list goes on, so go check out that article. When you release music into the world, it’s out there permanently. Whether it’s available legally or illegally, for download or stream, it can make it across the globe in an instant. Many countries (like the US) have laws in place to regulate commercial music use. But without song identification and verification, which uses metadata, this is not always an accurate process. Ever notice how your release information automatically populates in iTunes after a sale? Or how streams from Spotify and sales through Amazon both show on your Tunecore account? Or how all registered songwriters receive compensation from a PRO when their music is licensed? Metadata is the driving force for all these scenarios. Without metadata, none of this is possible and means you may not be receiving the royalty payments you have earned from commercial use of your music. Releasing music without accurate metadata is like writing a book report and not signing your name. You could’ve written the best essay the teacher has ever seen, but since your name isn’t on it, you don’t get credit. 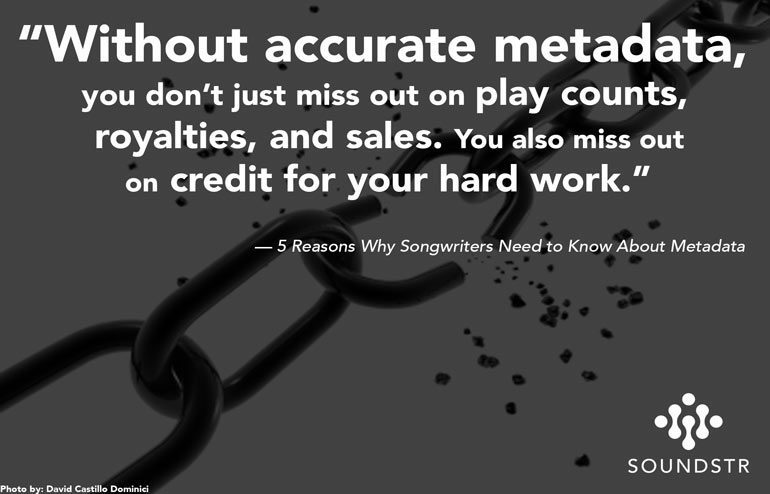 Without accurate metadata, you don’t just miss out on royalties, sales, play counts and more. You also miss out on credit for your hard work. You can’t track your growth as an artist, which can be essential to an artist’s success. Think about the effort you put into marketing, touring and social growth. This work focuses on increasing your visibility, including streams and sale counts. These numbers are especially important to record labels and sponsors seeking new talent. A lack of metadata surrounding your music could prevent the summing of these numbers. This may even hinder your chances with some professionals, at least in the earlier stages in your career. Imagine missing out on an opportunity just because a similar artist had slightly more sales? It’s amazing how much the impact a small set of data can have. There are several issues with the industry currently surrounding metadata. In order for someone to put this information to proper use, they would need access to several different sets of data. At the forefront of metadata are two similar sounding but unique codes: ISRC and ISWC. ISRC is the international standard recording code surrounding the sound recording of song. The ISWC is the international standard work code that represents the composition itself. Identification of real world use and royalty distribution requires both data sets. Unfortunately, several organizations control different segments of this data, resulting in limited access. This is part of a larger issue, which relates to the lack of standards around metadata. These standards include the exchange of data through and across the digital supply chain. This is also used to automate communication and management of messages and assist companies in their implementations of metadata. Companies like DDEX are working to build these standards. Combined with the push for transparency in the music industry, data like IRSCs and ISWCs could become more accessible. Bottom line: it’s currently a mess, but things are starting to change for the better. Two main components surround the use of metadata: identification and verification. What good is data if you cannot identify all information contained and verify its accuracy? Consider this when it comes to performing rights. Music users, like radio stations, TV networks, businesses and venues pay to use music. PROs collect these fees and distribute them to songwriters and publishers. Without proper metadata, music users cannot identify all music they use. This limits the way PROs verify music use and what songwriters receive performance royalties. In the case of live music performances, this forces the PROs to use proxies like radio to determine what artists are touring. Less than 2,000 radio stations use digital monitoring technology. There are over 10,000 radio stations in the United States. A recent study uncovered only 20% of the music used in those businesses was also broadcast on the radio. This means 80% of the songs heard in businesses were not receiving general performance royalties. Even worse, royalties were distributed to the wrong songwriters! Registering with music recognitions services (it’s FREE!) can help songwriters learn where their music is used in the real world. Recognizing the music businesses and venues use can help songwriters receive compensation for music performances. Additionally, songwriters can use this information to identify where fans are located to book tours, market new releases and route tours down to the specific venues their fans prefer. This is the power of unlocking data, and something that could play a major role in the music industry moving forward. The future looks bright for metadata. With an improved DDEX standard and the rise of topics like Blockchain in the music industry, people like Benji Roberts have a vision that could benefit us all. Blockchain provides a way to wrap all metadata into a single new file format, which has been dubbed “.bc.” Imagine a zip folder that contained all metadata around a release. This could include songwriters, publishers, album art, writing splits and more. The “.bc” zip-style file would require a new medium to decode, verify and play music contained within the file. As virtual reality quickly comes to the commercial market, a major opportunity for blockchain could be presented. If VR accepts the .bc file format, metadata could have much more of a presence in the open market. There is still a ways to go, but the vision is there. The concept has been the focus of many discussions (and debates), and we’re excited to see where it goes. Companies like Songspace are also fighting to cleanup the mess that is the current state of metadata. They offer songwriters and publishers a way to organize ownership splits, PRO information and more. We suggest checking them out and learning more about how they can help with your metadata. Metadata is crucial to the music industry, and the impact it can have on a songwriter’s career is substantial. Inaccurate metadata can hurt songwriter’s careers. This can range from royalty collections to sales, play counts and more. There are several problems with the current system, especially with identification and verification. But new mediums like VR utilizing formats like .bc could make things much less complicated. Staying informed is the first step. Registering with song recognition services can also help songwriters receive compensation for music performances. This is an area that’s changing in our industry, and we’re excited for the future. Interested in getting the most out of your metadata? Sign up for Soundstr’s recognition services for FREE at the link below. 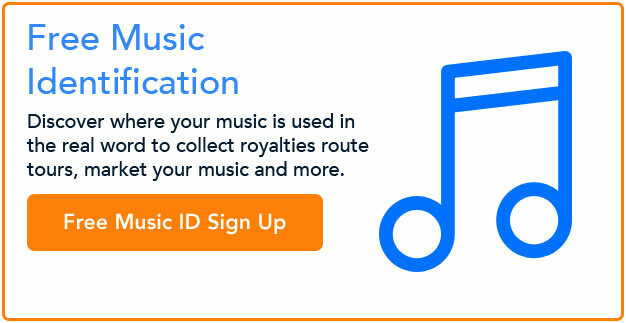 Discover where your music is used in the real world and start collecting the royalties you’ve earned.